The northern part of this area lay within Strata Florida Abbey’s Y Dywarchen Grange in the Medieval Period. 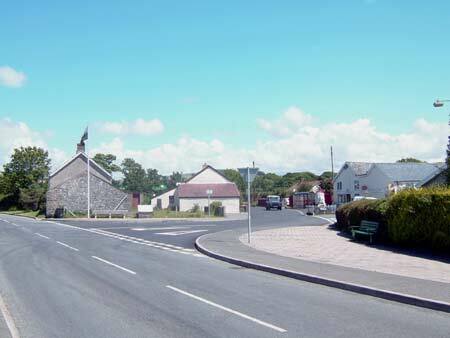 Traditionally the administrative centre of the grange was at Cwrt, which lies within this area. Williams (1990, 57) records a water mill and ancient barn here with gallows on the hill above. Following the Dissolution, a small independent estate - Court Farm - seems to have been carved out of the monastic lands, before being incorporated into the Gogerddan estate. The history of the small, nucleated village of Penrhyn-coch is un-researched and therefore not known. It is likely that it is a late development, and the morphology and map evidence indicate a small settlement here until the late 19th century. A church was not constructed until 1881 (Jones 1998, 499). It is a similar story for the smaller hamlet of Pen-bont Rhydybeddau, although this settlement seems to have been established in the 18th and 19th centuries to serve the metal mines in this area, and those of Cwm Daren and Twll y Mwyn located in neighbouring areas. Dispersed farmsteads represent the ancient settlement pattern of the area. These farms are likely to be of some antiquity; they certainly date to the late 18th century, and in all probability have their origins in the Medieval Period. By the late 18th century properties formed part of the holdings of the Gogerddan, Crosswood or Court Farm estates. Estate maps (NLW Gogerddan 67; Crosswood 345, 346; R.M. C22; Scott Archer 20; Vol 38, 6, 8, 10, 12, 14) depict several of the farms in a landscape of small, irregular fields and regular strip-like fields - essentially a landscape similar to today. Some of the fields depicted on the estate maps seem to be enclosed strips, indicating the former presence of a sub-divided field system out of which the present landscape has evolved. The 20th century has witnessed a rapid expansion of the village of Penrhyn-coch, with a new housing estate, a sports field and other developments. Metal mining in this area was concentrated at Bronfloyd. This was worked in the 17th century, with its richest period in the 19th century. Production finally ceased in 1892 (Bick 1988, 26-28). The garden at Pen-y-berth Farm is recorded on the Welsh Historic Garden Database. 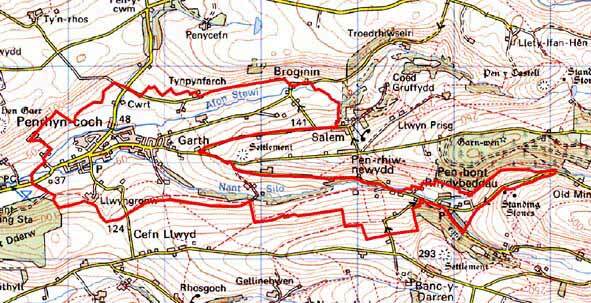 This area is centred on the valleys of the Afon Stewi and Nant Silo, and includes the valley floors and lower slopes. There is a height range of 50m to 110m. The field pattern of small irregular enclosures and regular strip-enclosures has survived intact for at least two centuries. This includes a long, distinctive boundary between enclosed strips and former unenclosed land on the north side of the Stewi valley. Field boundaries comprise earth banks topped with hedges. Close to Penrhyn-coch and on the valley floors hedges are in fair to good condition, but on the higher valley sides and towards the eastern end of the area they are becoming overgrown and derelict. Wire fences augment most hedges. At the eastern end, close to Broginin, dry-stone walls form some of the boundaries. Farmland is now almost entirely improved grazing. There are small stands of deciduous trees, especially on the valley floors, and a small conifer plantation. 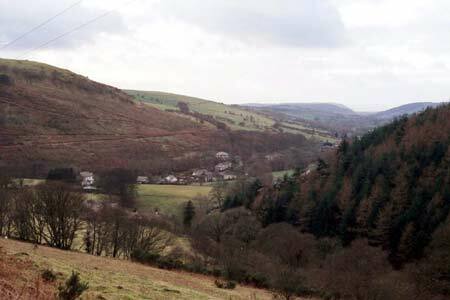 The western end of this area is dominated by the village of Penrhyn-coch, which sprawls across the valley floor. There are two older cores to the village. One is centred on a stone-built 19th century church and includes stone and brick built 19th century ‘villas’ as well as typical late 19th century worker houses. The second is at a higher level and consists of short terraces of rendered stone single storey worker cottages with a chapel as a focus. Extensive (for upland Ceredigion) late 20th and early 21st century housing developments, a school and services now connect these two older cores. Modern housing is also located at Pen-bont Rhydybeddau, but here the historic core of bare stone detached and semi-detached worker houses in the typical regional Georgian style of the late 19th century is still largely intact. Several of these buildings are listed. Other late 19th century worker houses are distributed across the area, but agriculture is the main function of the dispersed buildings. Farmhouses are mid-to-late 19th century, are relatively small, of two storeys and in the typical Georgian vernacular style – gable end chimneys, central front door, and two windows either side of the door and one above. Some have several ranges of stone outbuilding set around a yard, but most have just two to three ranges. Some farms are not working now and their outbuildings have been converted to other uses, such as light industry. Working farms have modern agricultural buildings, with very extensive ranges on larger farms. The remains of Bronfloyd lead mine, including buildings, processing floors and tips are an important component of the historic landscape. The recorded archaeology in this area mainly comprises post-Medieval extant secular and ecclesiastical buildings and metal mine remains. However, a time-depth element to the landscape is provided by a Roman coin hoard, a Bronze Age round barrow and a Bronze Age burnt mound or hearth. To the south and north former unenclosed land clearly defines this landscape area. 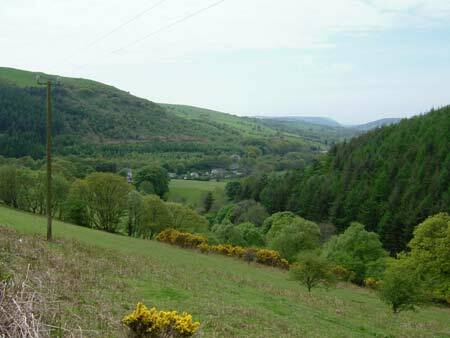 The landscape area to the west has not yet been defined, while to the east the woodland and small fields of the upper valley of the Afon Stewi represent a substantially different character area.